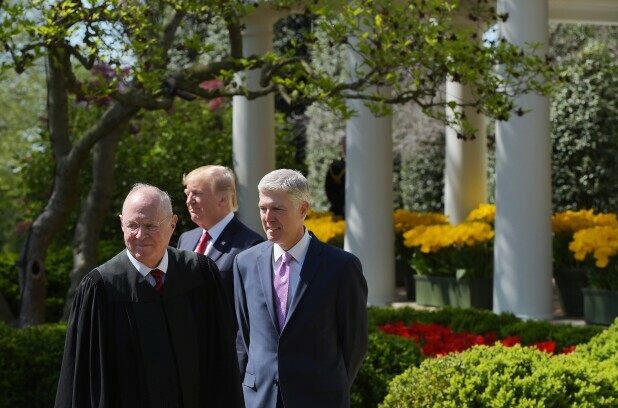 (L-R) Justice Anthony Kennedy, US President Donald Trump, and Neil Gorsuch take part in Gorsuch's swearing-in ceremony as an associate justice of the US Supreme Court in the Rose Garden of the White House on April 10, 2017 in Washington. Former clerks of Justice Anthony M. Kennedy describe him as an open-minded jurist, a model of civility, and a hard worker. Kennedy announced his retirement from the U.S. Supreme Court effective July 31. He served on the federal bench for 43 years; 30 of those years were on the Supreme Court. Kennedy’s civility shone through at all times, even when he debated difficult cases with his clerks. He knew exactly what to say to defuse our sometimes heated conversations, Nancy Combs told Bloomberg Law. Combs clerked for Kennedy from 1995–1996. Kennedy’s attitude rubbed off on his clerks. “I learned a great deal during those discussions about engaging in civil discourse no matter how important the issue or how strongly one felt about it,” Combs said. Kennedy is a “profoundly good, decent, civil man,” Joshua Matz told Bloomberg Law. He cared about civility not only in his work but also in his relationships, including those with his clerks, Matz said. Matz clerked for Kennedy from 2014–2015. He is of cousel at Gupta Wessler PLLC in Washington and at Kaplan & Company LLP in New York. Kennedy was a “wonderful boss” who enjoyed his life and appreciated that he had a great job, Daniel Epps told Bloomberg Law in an email. Kennedy’s dedication to his work led Epps to believe he’d never leave voluntarily. Epps clerked for Kennedy from 2009–2010. He is a professor at Washington University School of Law in St. Louis. Kennedy was a role model to his clerks outside the courtroom as well. Kennedy and Justice Antonin Scalia attended a Baltimore Orioles games with their clerks in 1993. The group was sitting by the dugout when a huge fight broke out between the Orioles and the opposing team. “At one point, players were fighting just a few feet in front of the two justices,” Matthew H. Lembke told Bloomberg Law in an email. Although almost everyone else in the stadium was “screaming and yelling,” Kennedy and Scalia sat there “as though nothing was happening, showing that the dignity required of a Supreme Court justice extended to every facet of their lives,” Lembke said. Lembke clerked for Kennedy from 1992–1993. He is an attorney at Bradley Arant Boult Cummings LLP in Birmingham, Ala.
His former clerks describe a very hard worker. He was tireless and didn’t seem to need much sleep, Lembke said. Matz would often arrive at the court around 6:30 a.m. to find that Kennedy had already been at work for a couple hours. He’d work all through the day but still be available late at night or in the early morning for emergency motions, Matz said. Clerks struggled to keep up with him, he said. But Kennedy still made time for them. He would debate argued cases with them, going “back and forth on several drafts as he got the language perfect,” Epps said. Kennedy would frequently sit with the clerks for breakfast and lunch to discuss cases, Matz said. He had an “open-minded and fair” approach to the law, considered all aspects of every case, and didn’t jump to quick conclusions, the clerks said. Kennedy didn’t have a “rigid methodology” that would dictate the outcome of a case, like Scalia did, Epps said. He understood the Constitution as a living document, Matz said. His opinions on LGBT rights and abortion are examples of this, he said. He wanted to make sure that the values embodied in the Constitution “made sense in the modern world,” Matz said. His dedication to the Constitution caused him “to be virulently criticized both from the left and from the right from time to time, but throughout his decades on the bench, he has remained steadfastly committed to the principles that he believes underlie our democracy,” Combs said. Kennedy’s views didn’t follow a strict ideological orthodoxy, and we’re “unlikely to see another Justice like him anytime soon,” given the climate surrounding the judicial selection and confirmation process, Epps said. “He is a warm, thoughtful, curious, and generous person who was a joy to work for,” he said.